Summers and vacations go together like peanut butter and jelly – after working hard all year, everybody deserves a chance to kick back and relax. But who says you need to travel to far-flung locales to have the holiday you deserve? 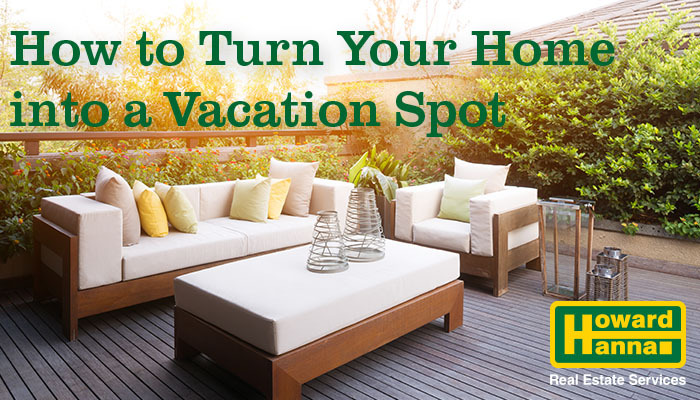 If you follow these tips, you can create a private sanctuary in your own back yard and get the vacation experience without leaving the comfort of your own home. The first key to establishing a backyard vacation destination involves carving out your own separate space. It’s hard to properly unwind if noises and distracting visuals are constantly reminding you of the neighbors next door. Creating separation makes it much easier to maintain the illusion that you and your friends and family have the area to yourselves. There is a popular saying that “good fences make good neighbors,” and it’s absolutely true. Well-placed fences and hedges provide privacy while also screening your backyard retreat from the surrounding noise and confusion. Other structures like gazebos and pergolas can let you create well-defined sub-spaces for when different members of the household need some alone time for themselves. In the social media age, everyone wants to look great for all of their followers and internet friends, but don’t forget that you have to actually live in the space you’re designing. When it comes to choosing furnishings for your backyard retreat, comfort needs to come first. If you don’t like the way your space feels, you won’t find yourself spending time there, regardless of how it looks. Before buying patio furniture, make sure that it is a good fit for your physical proportions and has enough padding to remain comfortable during extended use, and be certain that the same is true for everyone else living with you. Give yourself different options for posture, with both straight-backed chairs for social settings and recliners for pure relaxation. Add an awning or umbrellas to provide areas of shade in the warm summer months, and plan windbreaks to shield yourself from blustery breezes. In the evenings, don’t forget some citronella candles to keep invading bugs at bay. Privacy and comfort aren’t enough for the ultimate backyard retreat – you also need interest and stimulation. Flowers and perennial plantings serve as an attractive backdrop, adding both visual flair and soothing scents to your surroundings. Birdbaths and bird feeders attract native wildlife, bringing new sights and sounds of their own. Fountains and water features engage multiple senses at once, thanks to the tranquil sound of the flowing water, and you can get a similar effect from the sights and sounds of a crackling fire in a fire pit or an outdoor fireplace. Landscape lights can create new perspectives on your surroundings as they showcase the transition from day into night, and an outdoor sound system lets you tailor your audio environment to your mood. What’s the point of a perfect backyard vacation if you can’t share it with anyone else? If you design your layout to incorporate spaces focused on specific themes, it makes it easy to find reasons to spend time enjoying them together with loved ones. Summer grilling is an American classic for good reason. With all kinds of gas, charcoal, and electric grills available at different price points, there’s no excuse not to enjoy dining al fresco this summer – particularly if you have a cozy nearby nook set up for meals. For many, a hot tub is the ultimate in relaxation, and a private hot tub area with access to a mudroom or bathroom makes it easy to change, step outside, and enjoy a soothing soak. An outdoor bar lets you channel your inner Tom Cruise from Cocktail, mixing up cold drinks for your guests at private get-togethers. Choose theming that fits your personal taste, and add fans to beat the heat and a TV so you don’t miss the big game. Above all, if you want the perfect summer vacation spot, you’ll need the home to match it. To find the home of your dreams and start turning it into the ideal getaway, visit www.HowardHanna.com and check out all the best listings in your area and information on how Howard Hanna’s one-stop shopping can take the worry out of the buying process.